Learn how to separate the hubs from the drums and swedge new drums to your hubs. When are drums no longer safe to use? What should I look for when shopping at swop meets for Model A drums? Why is it important to true brake drums and hubs together? How should I remove old brake linings from brake shoes and replace them with new linings? 1928-31 Front Brake drum. Excellent quality cast iron brake drum. Almost a must when redoing your entire brake system. Old original drums should be no less than .130" thick. .
1928-35 Original syle hub stud with the flat sides. these fit loose in hole and are tightened when the hub and drum is swedged together in a press. Note: These bolts have longer shoulders for cast iron drums. The shoulder must be turned down for use with original stamped steel drums. AR Front Brake drum for the very early 1928 Model A. Excellent quality U.S made cast iron brake drum. Almost a must when redoing your entire brake system. Old original drums should be no less than .130" thick. Made in USA. 1928-31 Rear Brake drum. Excellent quality U.S made cast iron brake drum. Almost a must when redoing your entire brake system. Old original drums should be no less than .130" thick. Made in USA. Rear hub Stud 1928-31. 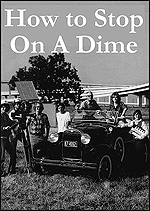 The original type. Fits loose in hole and is tightened when the shoulder is swedged in a press. Note: These bolts have longer shoulders for cast iron drums. The shoulder must be turned down for use with original stamped steel drums. Made in the USA. 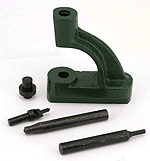 Stud swedging tool for the 1928-31 Model A Ford and 1932-48 Ford V8. This tool is a must for putting new wheel studs in your model A or V8. The studs don't just push in place like modern studs. These studs will just push through the hole, and the shoulder of the stud actually gets squashed against the drum. This is the tool that squashes the shoulder against the drum. Must be done using a 25 ton hydraulic press. Made in the USA. Complete new Rear Hub/Drum Assembly for the 1928-31 Model A Ford. A new brake drum and hub assembled with new wheel studs. The drum has been turned true after the hub was installed. Completely renew your front brakes. You will get a good used Backing Plate, New Grease Baffle with new lined good used shoes. Restored Backing Plates, Sand Blasted and Powder Coated. Rebuilt the Roller Tracks, installed New Brake Linings on our good used shoes. All other parts installed are new unless not available. No Painting needed. Ready to bolt on!! Kit is for one side. (2 kits required). This is a brand new rear backing plate with the brake adjustment wedge housing and rear roller track installed. Powder coated in gloss black. 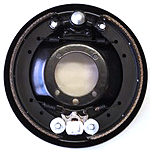 Completely, renew your rear brakes with our all new rear backing plate system. Left side. New linings will be installed on new shoes and the shoes arced to fit a new brake drum. These units are sold ready to install - NO PAINTING NEEDED, THESE ARE POWDER COATED - just install on your hub. One set does one side. Completely, renew your rear brakes with our all new rear backing plate system. Right side. This is a set of 2 castle nuts and cotter pins used to secure the front brake actuating assembly to the spring perch. Note: These castle nuts were used from the beginning of production until mid 1929. This is a set of 2 hex nuts and 2 lock washers for mounting the front brake actuating assembly to the spring perch. Note: These were used from mid 1929 until the end of production. Hydraulic brake adapter rings, for using 1939-48 hydraulic brakes on 1928-36 spindles. The large ring centres the backing plate on the spindle and the small ring slides over spindle behind the inner bearing. Price per set. This front kit has the tracks with rivets and the rivet setting tool. One kit does both front wheels. Made in USA. Brake adjusting tool 1928-31. Brakes are adjusted at the wheels in relation to how far brake pedal is depressed. This handy tool pushes the brake pedal down to a specific distance so you can adjust each wheel. Top of tool hooks around steering wheel. Made in USA. Brake track mount set 1928-31. The special rivets that hold the brake tracks to the backing plates. Made long enough to use on front or rear. Install these before you paint, since they need to be heated red hot in order to swedge them in place. Made in USA. Brake Track rivet tool 1928-31. The heads of the A-2013 rivet set in the centre of this tool and serves as bucking bar when peening the rivets. Keeps the heads from being damaged. Made in USA. A pack of 80 brass tube style 1/8" rivets that are used for putting brake linings on. Made in USA. A pack of larger 3/16" brass tube style rivets that are used for putting brake linings on the AA and BB truck. 60 rivets per set. Diameter is .184"; length by .365"
Brand New Lined Brake Shoe. 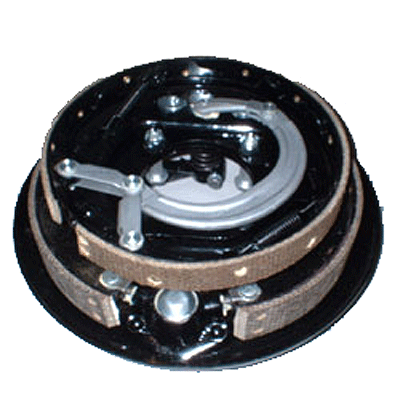 Most brake shoes are worn at the holes for the roller pins and the adjusting shaft pins. This extra wear will affect how your car will stop. These new shoes are made from the Ford factory blueprints. Priced each. Brand New Basic Brake Shoe, unpainted and unlined. Most brake shoes in the swap meets are worn at the holes for the roller pins and the adjusting shaft pins. This extra wear will affect how your car will stop. These shoes are made from the Ford blueprints. Priced each. Full Brake lining set for the Model A Ford. This lining is the soft woven type with brass wire in the lining. One set will do all four wheels. Complete with rivets. 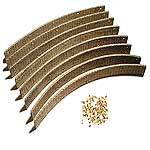 Full modern brake lining set, for improved braking over woven linings when used with cast iron brake drums. This lining is not recommended if you are still using the original stamped steel drums. This is a soft molded lining, not the old hard style molded lining. No more glazing or grabbing, longer life than woven linings. steel fibers keep cast iron drum clean without damaging the drum. Made in Germany. Set of 8 linings to do all four wheels. With rivets. Set of four Brake linings to do front OR rear brakes. This lining is the soft woven type with brass wire in the lining. Complete with rivets. This is the easy way to stretch the brake spring on the backing plate for installing or removing the Model A Ford brake shoes. Hook the tool to the end of the brake shoe. The handle provides leverage to rock the shoe in or out of the brake wedge. Full set of cad plated pins for the brake adjusting shaft. These are the pins that holds the A-2042 adjusting shaft onto the brake shoe. Made in USA. Set of 8 pins. Length 7/8" x 7/16" diameter. Complete brake spring set for the 1928-31 Model A Ford. Set includes all of the springs for service and emergency brakes inside the drum. Price per set. Brake Adjustment wedge for the 1928-36 Fords. This is the wedge with the square on the end that sticks through the backing plate so that you can adjust the brakes. Plated and heat treated. Need four per car. 1928-36 Brake Adjusting wedge tool. The tool is made special to slip over the square end of the adjusting wedge for adjusting the brake. 1928-31 AA Truck brake Adjusting wedge tool. Use this tool to help adjust the brakes on your AA Truck. Standard 1928-34 Brake adjusting shaft. 1928-34 Brake Wedge for the front brakes. This is the piece that the brake operating pin pushes on to actuate the front brakes. Brake Wedge stud washer 1928-34. Slips over front brake wedge stud after wedge is on. You will need two of these per car. Made in USA. 1928-31 Model A brake wedge stud nut. The castle nut for holding the wedge stud in place on the backing plate. Brake Operating pin 1928-31. The pins that operates the front brake shoes. This pin runs from the brake actuating arm down through the centre of the king pin, and into the front brake wedge. 7.280" long. Made in USA. Brake Operating pin shims 1928-31. If your pins or the other operating pin components are worn, just use these shims to take up slack! These will adjust the angle of you front brake actuating lever. Pack of 2. 1928-31 Small king pin felt . This felt is jammed inside the spindle bolt, and the front brake operating pin goes down through the middle of it. Made in USA. This is the tool to ream the A-2227 bushings for a perfect fit. Reaches both bushings in one operation. Custom made for this application. This bushing driver is used to drive the A-2227 bushings out of the brake camshaft housing and the emergency brake toggle lever housing. Also used for installing and removing the Model T T-2714 bushing. Preventing damage to spindle arm. Rear wheel Grease Baffle 1928-31. Used on the rear wheels of the model A to keep grease off of the brake linings. Mounts under nuts that hold backing plate to axle housing. Made in USA. Complete backing plate mounting bolt set. Special cadium plated bolts and nuts that hold the rear backing plates and the radius rod to the axle housing. This set contains 2 long bolts, 2 short bolts, 4 nuts, and 4 cotter pins. One set does one wheel. A very nice black rubber boot that fits over the brake lever. Keeps the road dirt from getting in the car. This is a polished stainless plate that screws to the floorboards to hold your brake boot in place. Not original but makes a nice finisher for the brake lever boot. 1928-31 Gear Lever Boot. A very nice black rubber boot that fits over the gear shift lever. Keeps the road dirt from getting in the car. This is a polished stainless plate that screws to the floorboards to hold your gear lever boot in place. Not original but makes a nice finisher for the gear stick boot. Brake boot retainer 1928. Used only on the early 28's with the hand brake that came through the sub rail on the left. Made in USA. Reinforcing Bands 1928-31. When using old brake drums that have been turned several times these are almost a must. These press over outside of drum to give the worn drum much needed support. Made in USA. .
Standard Flathead Ted Brake Floater kit for the Model A Ford. SORRY, WE NO LONGER OFFER THIS PRODUCT. This is a complete new actuating arm assembly, made using the original blue prints. Complete with actuating shaft & front brake lever.